Naturally ventilated buildings have great potential in terms of comfort and energy saving. However their design is difficult, as the effectiveness of the ventilation is affected by many parameters. Through a parametric CFD (Computational Fluid Dynamics) simulations, graphical tools are generated to evaluate, adopting a comparative approach, the ventilation performance of a morphological family of buildings and to choose the shape of the building, its orientation and the position of the openings. In particular we focus on the interaction between the shape of the building and the wind, that produces a pressure distribution over the building’s envelope, activating an internal airflow through the openings. The pressure difference between any two points lying on the envelope is considered as the force driving of the natural ventilation that depends mainly on the aspect ratio of the building (r) and of its orientation (α). Changing r and α in a specific range, we represent some different configurations. Then we reduce the problem from 3D to 2D, studying the airflow around the vertical and the horizontal cross-section of the building. By knowing the pressure values, we create some plots useful for the positioning of the openings and we calculate an indicator, measuring the global performance of ventilation of the building. By plotting the indicator of the ventilation potential, it is possible to compare the performance of a morphological building family. The graphics can be used by designers without any particular skills in aerodynamics. Natural ventilation has various functions such as renewing hygienic air, passive cooling and comfort. One of the most recognized advantage is using the airflow to remove indoor pollutants and to guarantee a good indoor air quality (Mochida et al. 2005). In a naturally ventilated building it is possible to have a wind driven ventilation or a stack ventilation. The wind driven ventilation depends on the impact of the wind over the building envelope, which produces a variable field of pressure. Its effectiveness depends on the wind and on the building shape. Consequently, the buildings are designed by choosing adequately their orientation, shape and the position of openings (Gandemer 1992). The internal partitions also influence the wind ventilation (Chu, Chiu & Wang, 2010) but this topic is not discussed here. On the other hand, the stack ventilation is driven by the difference between the outdoor and the indoor air density, but also in this case, the wind affects the system (Gładyszewska-Fiedoruk & Gajewski 2012). Consequently it is important to consider the wind also for the design of a stack ventilated building. Currently, naturally ventilated buildings are rare since the complexity of the design process. Indeed, it is imperative to design the building as a system naturally ventilated from the first stages of design, using theories of aerodynamics that are not within the reach of everyone. Some researchers have already worked on simplifying this task, creating graphs covering a wide range of configurations and simplifying the first stage of design of the building. Etheridge (Etheridge 2002) produces some morphological indications of pre-sizing among charts and graphs by using the results of theoretical, numerical and physical experiments. He also analyses the natural ventilation of tower in (Etheridge & Ford 2008) and gives some indications on the building shape. where Ps is the static pressure at a given point on the building facade, Po is the static reference pressure, Pd is the dynamic pressure (the pressure is expressed in Pascal units), ρ is the air density (kg/m3) and U is the wind speed of undisturbed flow (m/s). Cp is obtained by wind tunnel tests and CFD simulations. In addition it is possible to collect Cp using the parametric equations and some databases, derived from measurements. They usually focus on a single geometry with few wind directions. The best known parametric equation for low-rise buildings is that of (Swami & Chandra 1988) used also in the (ASHRAE 2001). Also (Muehleisena & Patrizi, 2005) have proposed a parametric equation derived from data given by Tokyo Polytechnic University (2007). Bonneaud, (2004) explores the pressure coefficients for the tropical houses. Other authors (Eldin 2007; Grosso 1992) have included the effects of a shielded environment. It is not an easy task to obtain the Cp, their distribution on the building’s surfaces and to extrapolate some morphological indications for the natural ventilation. In fact, there is not a quick and simple approach to estimate and visualise the Cp field, in order to conceive or improve a naturally ventilated building. Moreover, one needs to go further and estimate how the wind pressure on the openings acts on the internal ventilation. Here, we present a tool that provides a rapid and intuitive guidance for architects at the preliminary design stage of the building. This takes into account only the interaction between the wind and the building. With this tool a designer can choose easily the best shape and the best position of the openings of a linear or tower block building to generate a wind driven ventilation. We performed some isothermal and stationary parametric CFD simulations on simplified shapes of buildings, by computing the Cp pressure coefficients. Starting from this physical feature (Cp), we develop a method of analysis for the design of a building naturally ventilated. So it becomes possible to choose the best shape of a building and the best position of the ventilation openings. Graphic results allow us to have a comparative view on the ventilation performance of a whole morphological family and not just a single building. The design of the building becomes an inverse design: from the analysis of the ventilation performance you choose the optimal shape and position of the ventilation openings. This process is distinguished by the classic direct analysis that starts from the CFD study of a building and comes to building performance. To make the method more flexible and adaptable to complex geometries and large computing domains, we apply to any morphological family some conceptual and geometric simplifications. These allow the decomposition of a complex problem in easier problems and therefore more comprehensible and easily solved in less time and cost. Computational cost reduction allows us to increase the number of configurations analysed, by increasing the number of values assumed by the descriptive parameters of each configuration. The graphic tools are generated by a numerical iterative process performed in two environments: Cast3M (developed by CEA),1 to compute the pressure fields, and Wolfram Mathematica, to calculate the pressure coefficient difference and the global indicators of the ventilation potential. 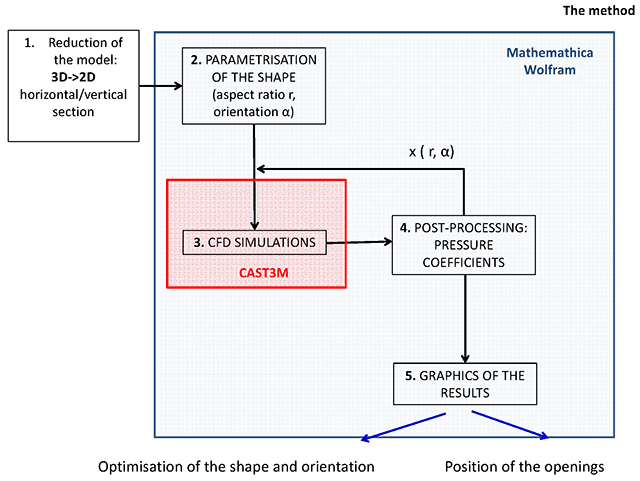 So, the pre-processing, the geometry of the model, the meshing generation and the computations were performed in Cast3M and the post-processing of the CFD simulations and the analysis of the results were carried out with the software Wolfram Mathematica. We choose a morphological family of buildings and we define one or two representative sections of the model: the horizontal section, for the tall buildings, or the vertical section, for the long shaped buildings. 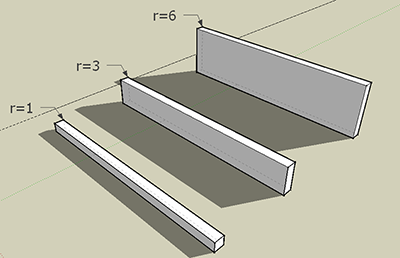 This operation reduces the dimension of the problem from 3D to 2D. The problem is decomposed in a 2-dimensional case in order to reduce the computation time. The vertical section or the horizontal section (a rectangle in our analysis), is described with a mathematic language, in order to express its shape with a descriptive parameter: the aspect ratio r. In this phase, it is necessary to choose the range of parameters involved to limit the study to the smallest number of possible cases. For the horizontal section we need also the wind direction α. So the computations are carried out several times by according to the range of geometrical parameter r and α. Once the geometry is defined, the computational domain and the parametric mesh are created in Cast3M with characteristics strictly related to the geometry of the object. The pressures on the contour of the model are obtained with the simulations of a stationary turbulent flow. The post-processing is performed in the environment of Wolfram Mathematica by computing for each configuration the indicators DCp and ADCp. These are the measure of the ventilation potential and the pressure distribution Cp. The indicators take in account the pressure difference between one point and another on the surface of the building by representing two hypothetical openings on the building envelope. All indicators are plotted comparatively. These graphics help the designer first, to optimize the shape of a building, and second, to locate the openings on the building’s envelope. Conceptual scheme of the method. The building is insulated and located in a not shielded area such as a coastal area, a flat ground without or with few adjacent buildings. In an urban area we consider only the area of building emerging from the constructions. In the presence of obstacles upstream of the building of height, hobst, these can be neglected if their distance from the building Dobst ≤ 4hobst. 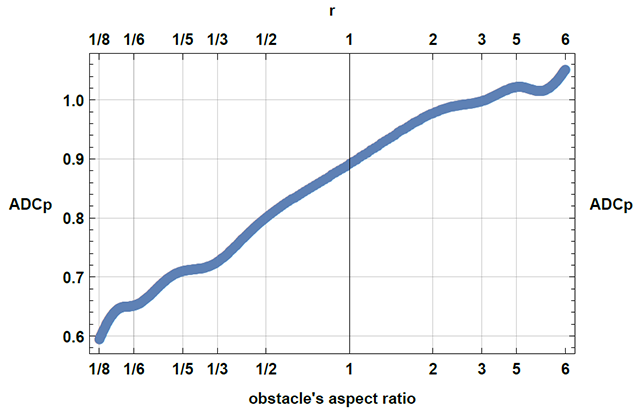 Obstacles may also be neglected if their width is less than the size of the building width and hobst ≤ 15 m (EN15242 2008). The proposed model takes into account an isothermal flow. The convective effects associated with the thermal gradients in a building, or between building and the environment, are not simulated here. The results cannot be used for the prediction of stack ventilation, but only for systems where the wind effect is prevalent. We note also that a good stack ventilation system should be designed considering also the effect of the wind on the building (Lomas 2007), so our results can be used to couple the ventilation systems (stack and wind driven ventilation) in order to facilitate its operation and not produce a short-circuit of the other. Furthermore the airflows around the building also affect mechanical ventilation systems. So it is useful to consider the pressure distribution on the envelope to improve the performances of the mechanical ventilation and to choose the best position of ventilation device on the envelope. The buildings are elongated in order to assimilate the 3-dimensional flow to a 2-dimensional flow in a horizontal or vertical plane, by excluding the boundary areas of the building. It is possible to use the results without incurring errors by deleting the portion up to 15 m from the ground and removing the last floor of the building (UE 2008). The results are valid for an incompressible flow. Physically this occurs when the Mach number is <0.3. So, by considering that Mach’s number is the ratio between the velocity of the flow and the velocity of the sound, it deduces that the results are valid for the wind speed about <102 m/s. The results are valid for the bluff bodies, which include many common geometries of civil engineering (buildings, bridges, towers). Bluff bodies are those bodies where the greatest contribution to the drag force is due to the pressure forces (Tietjens & Prandtl, 1934). The results are correct to simulate the aerodynamic phenomena with a Reyonlds number >104. In particular we estimate that the influence of the Reynolds effect, for Re >104, on the complex of the tool is negligible, and the results can be used for any civil application. The solutions are length independent within the range of sizes of buildings, so that an adimensional description of the geometry can be adopted. In particular, by considering the theory of (Tietjens & Prandtl 1934) about the bluff bodies and the recent researches of (Hoxey et al. 1998), (Larose & D’Auteil 2006) and (Simiu & Scalan 1996) that show the dependence of the results on the Reynolds’number only in some elongations (1/4 < r < 1) of a rectangle (and only on the lateral sides) and by considering that this tool is an aiding conception method for a preliminary stage of design and not a dimensioning method, we can applied the tool for all bodies with sharp edges. The internal losses, by depending on the internal partitions of the building are neglected. Notice also that, in the computation of the indicators, a pair of points is selected by considering only the potential flow occurring between them and not considering more complex ventilation patterns (which could be related to the interaction of several other inlets and outlets). r = n–1 for n = 1, 2, …8. r = n for n = 1, 2, …6. We have a total of 13 configurations. The sections are used to build a domain suitable for the CFD computations. The dimensions of the computational domain are parametrized, by according to the aspect ratio r of the cross section shape (see Figure 2). Geometric scheme and mesh of the computational domain, vertical section. Variable parameter: aspect ratio r = H/B. In the image r = 1. The analysis of the pressure field is performed by simulating the airflow past the rectangular obstacle lying in a flow canal (for the vertical section). The direction of the air flow is fixed along the longitudinal axis. The wind flow is simulated with a constant profile velocity over the channel height. 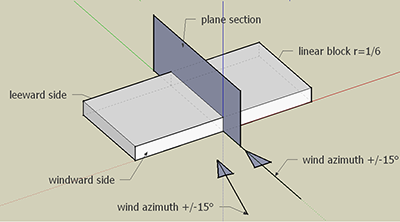 With this model the wind blows only from the front/back side, but experimental evidences show that this representation approximates a wind blowing between +/–15° out of the plane (In fact, in wind tunnel, the aerodynamic experiment of naturally ventilated buildings are usually performed each 30°). The simulations are repeated by changing the value of r and α, by according to the values of the range (see Figures 3, 4, 5). The numerical model adapts automatically to different shapes. An example of linear block with aspect ratio r = 1/6 with the vertical plane section in the middle of the building. Linear blocks with aspect ratio r = 1, 3, 6. Linear blocks with aspect ratio r = 1/6, 1/3, 1. The flow domain is split into a structured grid with quadrilateral meshes, fined progressively near the obstacle (see Figure 2). The number of elements varies depending on r (e.g. 26,480 for r = 1 for the vertical section simulations). The flow is incompressible. The volumetric mass density is 1.225 kg/m3, the dynamic viscosity is equal to 1.83 10–5 kg s/m and the cinematic viscosity is equal to 1.56 10–5 m2/s. Cν = 0.0845, Cɛ1 = 1.42, Cɛ2 = 1.68, σk = σɛ = 0.7179, η0 = 4.377, β = 0.012. We choose to perform CFD simulations with Re = 2.2 104. This value follows the benchmark proposed by (Rodi et al. 1997) and allows us to compare the computational results with the benchmark results and validate our model (This comparison was effectuated for the simulations of the flow around a square). In the inlet side of the canal, the velocity is uniform and horizontal with turbulence intensity equal to 2%. In the upper and lower bounds of the canal, the transversal velocity is zero. In the outlet the conditions are free. The wall-law (Chanson, 2009) is applied on the perimeter of the obstacle, so the velocity profile near the velocity profile can be analytically estimated with a log law. A first post-processing of the CFD simulations is based on the determination of the mean pressure coefficients Cp for each node of the perimeter of the obstacle (with equation (1). We plot the pressure coefficient in Figure 6, scaling the side of the obstacle to compare all configurations in the same graphic. Cp > 0 indicates the sides where the pressure is positive, Cp < 0 where there is a negative pressure. So, with this graphic it becomes easy to choose the position of the inlet, (that for this geometry is very simple, the windward side) and the best position for the outlet, where the suction is maximum. Vertical section: pressure distributions for all aspect ratios. The legend on the left side indicates the colours associated to each aspect ratio. Figure 7 shows the contour plot of DCp for some choices of the aspect ratio (r = 5, 3, 1, 1/5, 1/8). The graph is a coloured square divided into 9 zones, demarcated by different colours. These are progressive numbered on the contour of the square. The numbers indicate the edges of the obstacle: from 0 to 1 the points lying on the façade to the wind, from 2 to 3 those on the leeward side, from 1 to 2 those on the roof side. Each side of the contour plot corresponds to the contour of the obstacle. This numbering is like a reference system, with whom it is possible to situate in the graph the openings of the obstacle. In the plot, the green colour is the zero value, the shades of red indicate the positive values and those of blue the negative ones. 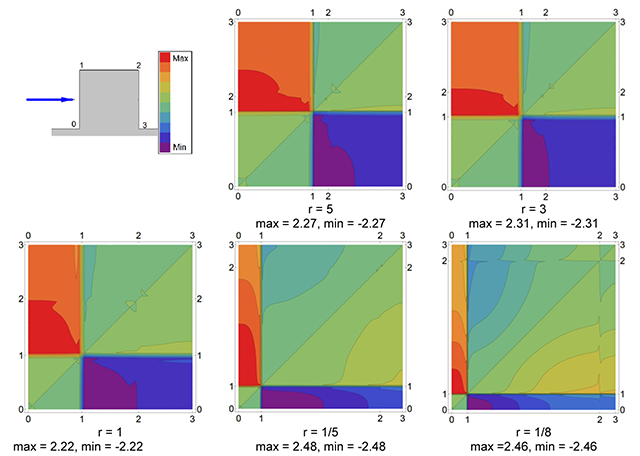 Vertical section: colour maps of the pressure differences DCp for aspect ratio r = 5, 3, 1, 1/5, 1/8. Each side of the contour plot corresponds to the contour of the obstacle. This numbering is like a reference system, with whom it is possible to situate in the graph the openings of the obstacle. In the plot, the green colour is the zero value, the shades of red indicate the positive values and those of blue the negative ones. In Figure 8 we show a detailed scheme to use the contour plot for the vertical section. Explanation of the colour map of the pressure differences DCp for r = 1.
with DCp the pressure difference and n the total number of contour nodes. ADCp, averaging such a measure on all possible pairs of openings on the building, can be selected to indicate the fitness of a configuration with respect to natural ventilation. The indicator ADCp is plotted in Figure 9 as function of the parameter r. The configurations having a good ventilation potential are those with a high value of the indicator. Plot of ADCp (averaged pressure coefficient difference) as a function of r (aspect ratio). 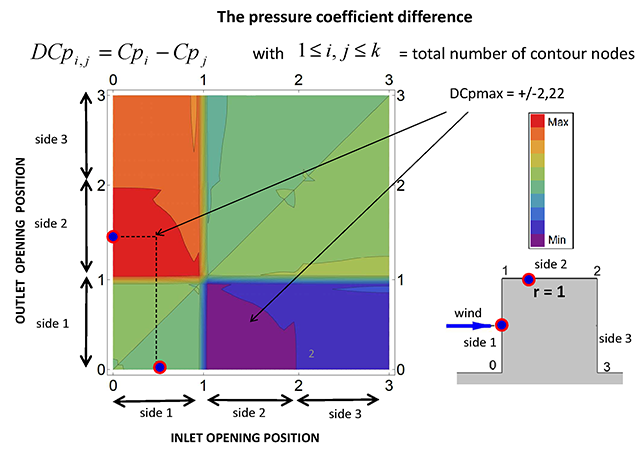 The pressure coefficient distribution (Figure 6), the colour map of the pressure differences (Figure 7) and the plot of the averaged pressure coefficient difference, the indicator ADCp (Figure 9), are all pre-sizing tools for naturally ventilated buildings. In this anlysis, these graphs are the results that come from the study of the morphological family of low parallelepiped buildings, the linear blocks. The pressure coefficient plot (Figure 6), scaling the side of the obstacle, allow us to compare all configurations in the same graphic. In addition, with this graphic it becomes easy to choose the position of the inlet (Cp > 0), and the best position for the outlet, where the suction is maximum (Cp < 0). In particular we notice that the maximum suction is on the roof near the vertex 1 and not on the leeward side (between vertex 2–3). We notice also that for r < 1/4 the difference pressure between the roof side and the leeward side is high. Hence, for long linear blocks il is more interesting to locate the outlet chimney in the left middle port of the roof (zone with an elevated suction). Always by regarding Figure 6, and by choosing to have only the inlets on the windward side we can see in Figure 10 the position of the outlets that maximises the difference pressure for some aspect ratios (r = 1/5, r = 1, r = 1/2). 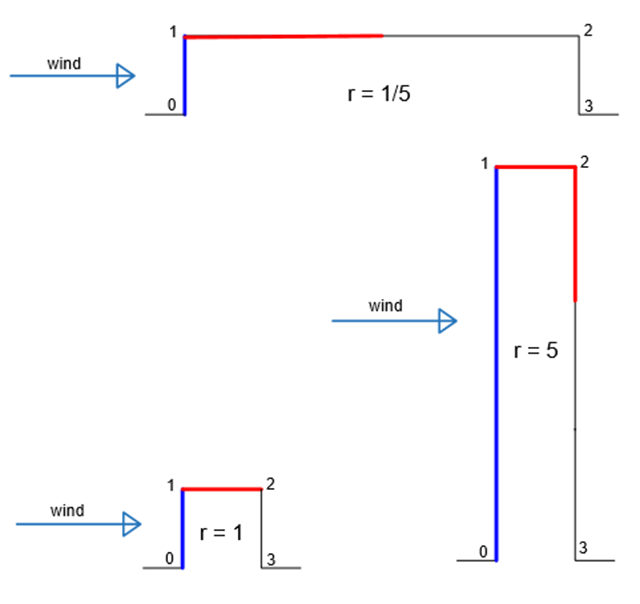 In blue the inlet position, in red the best outlet position for r = 1/5, 1,5. 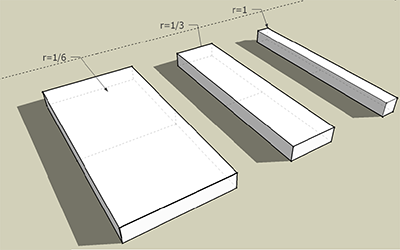 With the DCp plot (Figure 7) a designer can choose a point inside the plot that maximises the pressure difference, to obtain a pair of points lying on the building envelope. More the colour of the point chosen in the square is intense, more the pair of points to which it corresponds on the envelope will be appropriate for the natural ventilation. In this method we always consider the ventilation between only two points. Inversely, from the position of two openings on the envelope, it is possible to locate them on the sides of the square and to know the associated ventilation potential DCp. This contour plot can be computed for each configuration. It is evident that this graph can be used once the shape of the building has been chosen. Thus, the first graphic to use that can contribute to the process design is the ADCp plot. In particular, it possible to choose the building’s aspect ratio using the criterion of maximising the absolute value of ADCp. Then, the designer knowing the r, can choose the position of the openings using the graphics of Figures 7 and 9. In this way he does not need the experimental calculations or simulations, at least in an initial phase of conception. The ADCp plot (Figure 9) shows that a linear block with a large r has a good ventilation potential. This means that there are more possibilities to have a good natural ventilation for large r than a building with a low r (the study takes in account all possible direct pathflow from an inlet to an outlet trough the building). This result coincides with the evidence of common sense and allows us to deduce that the method is reliable. The use of this indicator thus becomes more interesting for more complex geometries, in which it is difficult to make the choices about the shape of the building envelope. At first sight the behaviour of ADCp, looks symmetric respect to the vertical axis r = 1, but instead the ADCp-line has a bigger slope for r < 1 than the slope for r > 1. Hence, when the building extends horizontally (r < 1) its ventilation potential decreases, undergoing a real jump for r = 1/8. Indeed also regarding Figure 6 we note a great difference of Cp line for r =1/8. The decrease of ADCp is higher than its increase in the cases where the building is stretched upwards (r > 1). In addition, buildings with r = 3, 4, 5 have a similar index value, so that a shape can be considered comparable to the other shapes in this range of values. Summarizing, once the best choice of the shape is using the graphic of ADCp indicator (Figure 9), one can call upon the information given by graphics of DCp to decide on the best location of the inlets and the outlets. Finally, if the designer wants knowing exactly the pressure coefficient, he just chooses the correct line in the graphic of Figure 6. The latter can be useful also to locate the air-inlet or air-outlet of a mechanical ventilation system. In fact mechanical ventilation is affected by the aerodynamic pressure over the building envelope developed by the wind flow. Here we propose a method to create some ventilation potential indicators useful for the pre-dimensioning for naturally ventilated buildings. So, using the indicators, we create some graphics directly usable by a designer not necessary skilled in aerodynamics. The method is based on the determination of pressure coefficients over a schematic representation of a building, its cross section, therefore, its results are reliable if some hypotheses are respected. In particular the plots of the ventilation potential indicators can be used as graphical tool in the preliminary stage for the design of long shaped buildings in locations where the effects of other obstacles can be neglected. 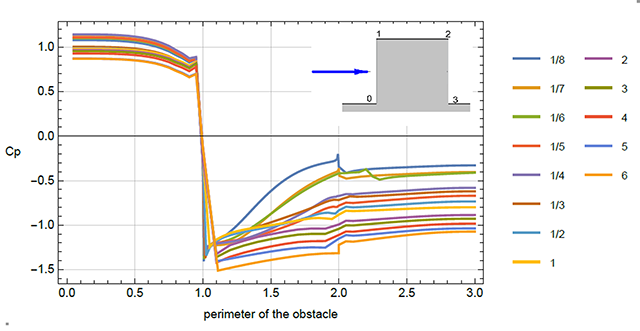 So parametric CFD simulations were used to compute the pressure coefficient field on the perimeter of a rectangular obstacle set in a wind canal. By computing the pressure we create three graphic tools that can be used for a linear block morphological family. By observing these plots, a designer can choose the aspect ratio of the building and the positions of the openings, in order to maximise the pressure difference between the inlet and the outlet of the ventilation. Hence, as a further development, we could apply the method to other shapes and create other graphic tools for different morphological building families. In particular the method could be applied for different cross section other than the rectangle as towers with rectangular,” L”, “T” or triangular cross section, in order to have a large panel of ventilation potential indicators. In addition, this method, developed essentially for buildings could be applied in other design topics. 1Commissariat à l’Energie Atomique et aux énergies alternatives (CEA). The first author is partially supported by Université Franco Italienne and Université Paris-Est. The authors wish to thank the “Commissariat à l’Energie Atomique et aux énergies alternatives (CEA)” for making Cast3M freely available. ASHRAE 2001 ASHRAE handbook fundamentals. Atlanta. Bonneaud, F 2004 Ventilation naturelle de l’habitat dans les villes tropicales: contribution à l’élaboration d’outils d’aide à la conception. Ph.D Dissertation, Université de Nantes. Chanson, H 2009 Applied Hydrodynamics: An Introduction to Ideal and Real Fluid Flows. CRC Press, Taylor & Francis Group, Leiden, The Netherlands, 478 ISBN 978-0-415-49271-3. Etheridge, D and Ford, B 2008 Natural ventilation of tall buildings-options and limitations. CTBUH 8th World Congress, Dubai. March 2008. Ferrucci, M 2017 Ventilation naturelle en architecture: méthodes, outils et règles de conception – Ventilazione naturale in architettura: metodi, strumenti e regole per la progettazione. Ph.D. Dissertation, Université Paris-Est, Università Iuav di Venezia. Gandemer, J 1992 Guide sur la climatisation naturelle de l’habitat en climat tropical humide, Tome 1: Méthodologie de prise en compte des paramètres climatiques dans l’habitat et conseils pratiques. Nantes: CSTB. Simiu, E and Scanlan, R H 1996 Wind effects on structures: Fundamentals and applications to design. 3rd Edition. John Wiley & Sons, New York, N.Y.
Swami, M V and Chandra, S 1988 Correlations for pressure distribution on buildings and calculation of natural ventilation airflow. ASHRAE Transactions, 94: 243–266. Tietjens, O G and Prandtl, L 1934 Applied Hydro and Aeromechanics. Engineering societies monographs. McGraw-Hill, New York. Tokyo Polytechnic University 2007 Aerodynamic, Database of Low-RiseBuildings. http://www.wind.arch.t-kougei.ac.jp/system/eng/contents/code/tpu (visited 2017-03-14). Turbelin, G 2000 Modélisation de la turbulence atmosphérique en vue de l’étude du chargement aérodynamique des structures soumises aux effets du vent. Ph.D. Dissertation, Université d’ Evry Val d’Essonne. UE 15242/2008 ventilation for buildings. calculation methods for the determination of air flow rates in buildings including infiltration. Technical report, European Standard, Europe.